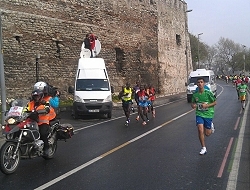 Istanbul Half Marathon: OB/DSNG broadcast production by ACTA Medya. 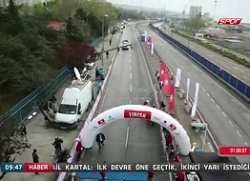 Istanbul, April 2015: A wide array of the latest transmission equipment was used for coverage of last weekend's Vodafone Istanbul Half Marathon. The live broadcast was produced by ACTA Medya and Media Pro Turkey, in co-operation with Camera Teknik. The event - broadcast by NTV Spor - started at 8.00 a.m. and lasted for 3.5 hours. The operation employed ten cameras set up in five DSNGs, while one helicopter and two motorcycles produced wireless signals via a RF system. Fixed RF points were set up in Eyüp, Feshane, Yenikapi, and Galata Tower. Also, HD signals produced by octocopters were used at the start and finish lines. At the start line, seven cameras including one Jimmy Jib, one wireless camera and one octocopter camera were set up, while at the Finish, eight cameras supported by one Jimmy Jib were used. 28 cameras in total were used during the production. 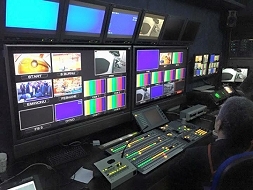 The outside broadcast, using two OB vans, was co-ordinated by an entirely Turkish team and was flawless thanks to the high level technical co-operation. The Istanbul Half Marathon is a new race organized by Istanbul Sports Events, which also organizes the Istanbul Marathon. Kenya's Evans Kiplagat won the men's race and fellow Kenyan Gladys Cherono came in first in the women's race.